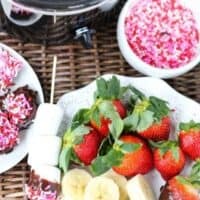 Slow cooker chocolate fondue couldn’t be easier – a perfect dessert for Valentine’s Day or for kids! I hate admitting this, but I’m somewhat of a Valentine’s Day Grinch. It’s not that I’m a love hater (I LOVE love! ), but I just don’t see the point of celebrating it on this one day. Why not celebrate love every day?! I also get sad for all of the people who are feeling sad about not having anyone to share it with. What can I say? I’m overly empathetic. Plus, getting dinner reservations on Valentine’s Day is the pits, right? 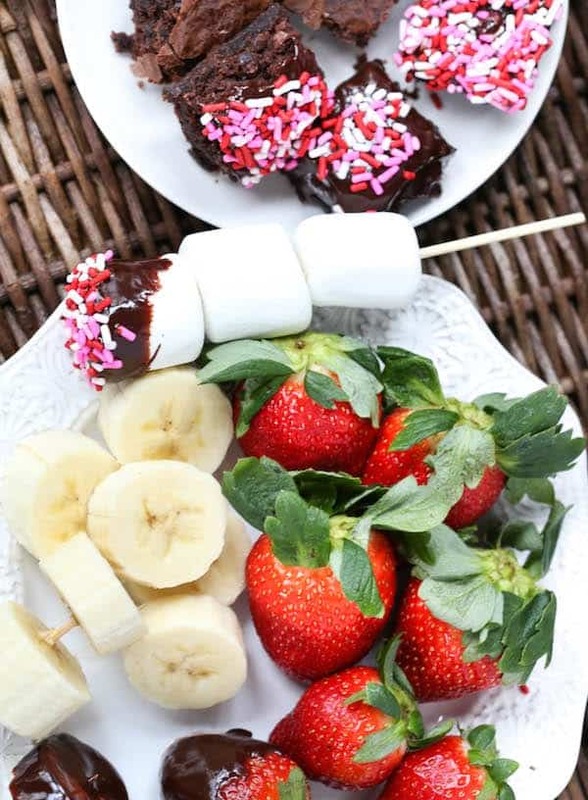 This is exactly why my husband and I have big plans to stay home and cook a nice dinner (or order pizza, whatever we’re feeling like) and then dive into a big bowl of this chocolate fondue. Chances are, you have pretty much everything you need on hand to make this fondue: chocolate, heavy cream (or evaporated milk), vanilla, and salt. The things you might need to pick up are the dunkables, which really are the most important parts of fondue, right? Good dunking materials are essential for good fondue. One of the obvious options is fruit. I used strawberries and bananas, but you could also do oranges, mangoes, apples, grapes, anything! I also whipped up a pan of brownies and cut them into little bite-sized pieces to dip in the fondue because chocolate on chocolate is a no-brainer. I added some Valentine’s colored sprinkles to attempt somewhat of a Valentine’s Day mood. The next dunker was marshmallows. These were delicious, but I think next time I will have some graham cracker crumbs on hand to dip the chocolate covered marshmallows in for a s’mores themed fondue. My absolute favorite dunking vehicle was potato chips. Crispy, salty potato chips. 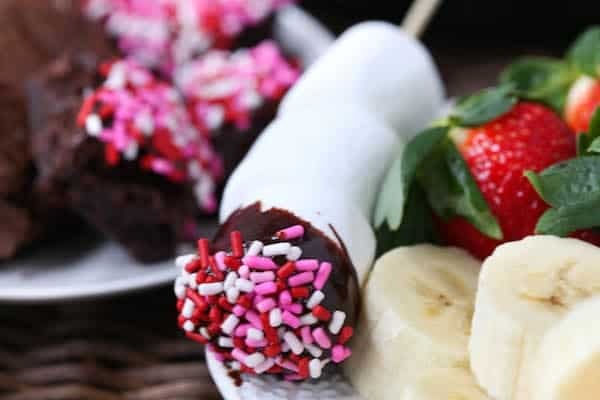 Probably not something you would think of right away when it comes to chocolate fondue, but trust me – it’s delicious. If you like the salty-sweet combination, then dunking potato chips in chocolate fondue is the right choice for you. Other ideas that I thought of after and will most definitely be trying out are Rice Krispie treats, pound cake, croissants, and bacon. <— YES BACON! 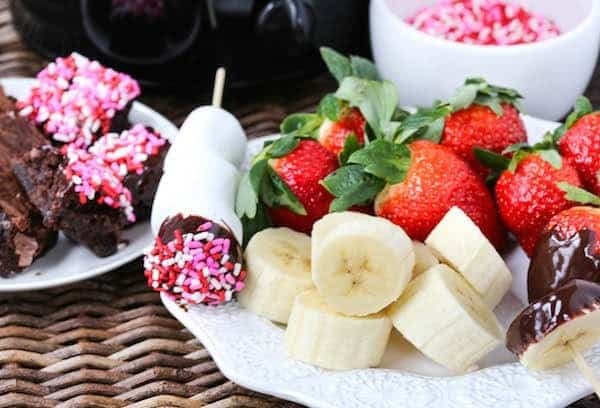 This got me thinking, what are YOUR favorite sweet fondue dippers? Are you a fan of the traditional fruit or do you like some wild and crazy things too? 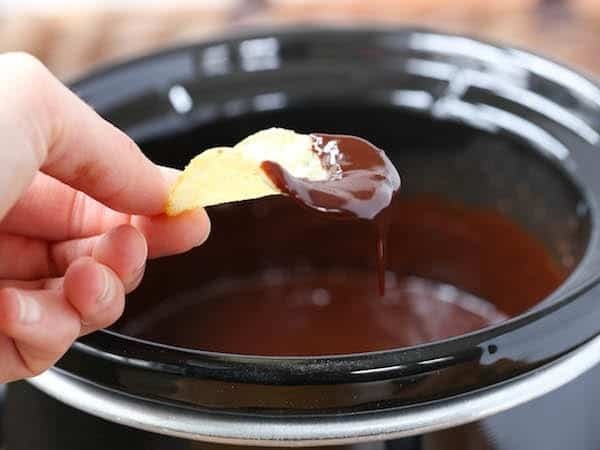 So whether you’re going out or staying in with your sweetie on Valentine’s Day or just hanging out in your PJ’s with your girlfriends, why not throw some chocolate into the slow cooker and dip things in it? Place chocolate chips, heavy cream, vanilla, and salt in slow cooker. Set on low and cook for one hours, stirring every 20 minutes. Once all chocolate is melted, the fondue is ready. 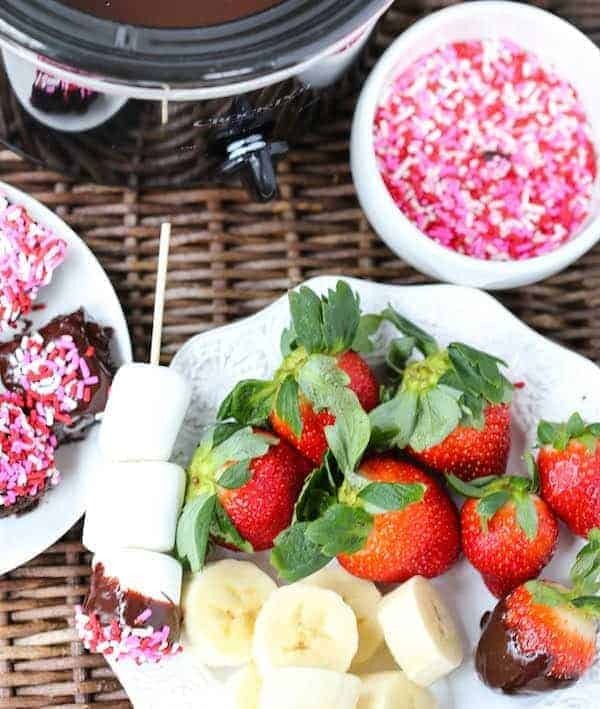 Looking for more Valentine’s Day sweets like this slow cooker chocolate fondue? 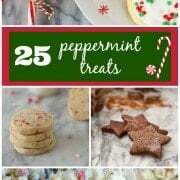 Try: Spiral Sugar Cookies, Cinnamon Cheesecake Mini Cheese Balls, Easy Red Velvet Cookies, Last Minute Valentine’s Day Cookies, Lemon Sugar Cookies with Strawberry Buttercream Frosting, or Red Velvet Cream Cheese Swirl Brownies. Thank you for the recipe! I want to try it next weekend for a brunch… how long can the crockpot be left on LOW once the fondue is ready? I hope 1 hour! My small crock pot does not have a “warm” setting unfortunately…. Thanks! Hi Elisabeth! I haven’t tried that so I can’t make promises, but I think it’s worth a try. All crockpots tend to be a little different. I have two and one is way hotter than the other one and always burns around the edges. I think it will be alright, though…just make sure to give it a stir every once in a while to keep it evenly heated. Hi! What size slow cooker did you use? The recipe makes about 3-4 cups of fondue, so a small size slow cooker would work best, but it should work okay in a larger slow cooker too, it will just be harder to dip out of. Umm.. sorry but I was wondering what size crockpot it would have to be cooked in or does it not matter? For entertaining at parties, what tips can you give to keep the chocolate a nice soft dipping consistency after the fondue is ready? Would you recommend switching it to the WARM setting afterwards? Would I need to keep stirring it every so often? 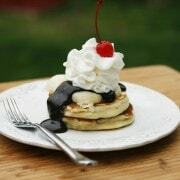 Thanks for this terrific recipe!!! Keeping it on warm and stirring occasionally should be perfect! 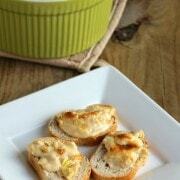 I seriously love this idea for easy entertaining! My birthday is in December, and that meant my mom had to get creative for birthday celebrations when I was a kid. One year she hit upon an angel food cake with candles, then cubed it up to dip alongside other dippers for chocolate fondue. Every year after that I requested chocolate fondue for my birthday ‘cake’. 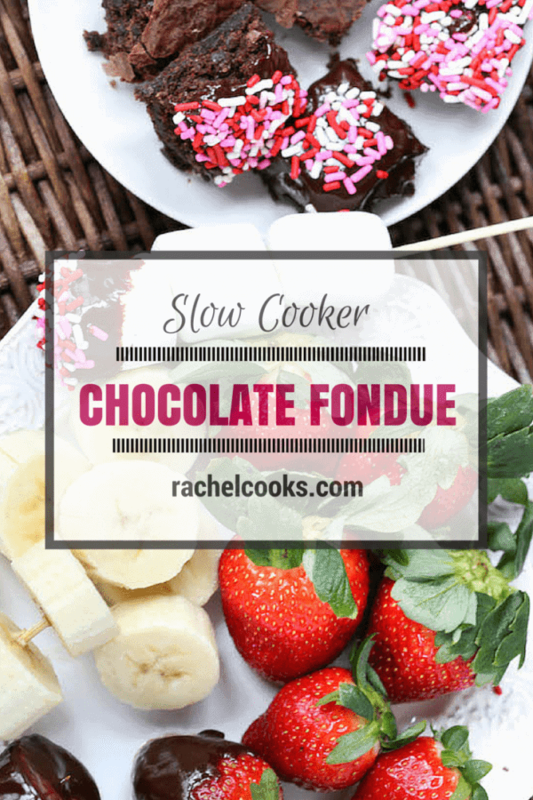 I love the idea of a slow cooker fondue–that means I can use my fondue pot for the entree and still have a fondue dessert without cleaning! sounds good. might be able to do it in my chocolate pro . YUM! This post makes we want to go to the Melting Pot asap (not sure if it’s national, but it’s basically an entire dinner and dessert served fondue-style, love it! ).